The devotional, Adored – 365 Devotionals for Young Women, is a great daily devotional for young women and here’s why we highly recommend it. I have read quite a few devotionals and I’ve found that most devotionals focus on general topics and life issues that are very broad based for believers and they can apply to a person of any age. There are good things in devotionals and devotionals can help us focus on God and take us deeper into His Word, but there is something special about having a daily devotional that is specifically written just for young women. The daily devotional, Adored – 365 Devotionals for Young Women, does just that. It gives young women of faith a daily Bible verse and a lesson that is applicable for their life and specifically addresses areas of concern for young women who struggle in their daily walk with God, especially in a secular world where all their friends might not be Christian. She said it dealt with real life struggles that young girls go through and addresses the daily life situations that they experience that their parents might not even be aware of. It’s almost as if it was personally written to them…and personally meant for them, and really, it is! I think every one of us struggle with things in life, but maybe it’s because a young woman goes through more emotional difficulties than most adults do that this devotional can be of great help for the young woman of faith. Adored – 365 Devotionals for Young Women, lets young women focus on one simple thing every day and so it’s not so overwhelming that they can’t understand it, and it’s neither too much material for one day nor too little. And it doesn’t sound preachy but helpful and very relevant to their life. It’s not too overwhelming, but rather, it’s just enough to make them value the daily Bible verse that goes with the daily devotional. They are short and sweet but to the point. Most importantly, this devotional shows them that God’s love always remains…and is constant, and that God is ever-faithful in His love for them, so to me, it appears that God’s love is the overall focus of this daily devotional, and that’s perfect since it will serve to reinforce the fact that God is with them every step of the way and with them every day. This hardcover daily devotional is beautifully illustrated, beautifully simple, and simply beautiful in content. The daily devotionals also have a place where they can add their own thoughts or record their daily struggles in life at the bottom of each devotional. It almost resembles a diary where they can record each day’s events, but I think the strongest point of Adored – 365 Devotionals for Young Women is that it has a specific purpose; a purpose for their life, and underlying that purpose is the love of God. The love of God does not change with the weather or attitudes or the way people react. God’s love is as consistent as God Himself…it is eternal, and if a young woman can discover that “God doesn’t just love us…He adores us,” (p. 7), it may help them to deal with their friends and peers, who at times, can seem anything but loving. If the young woman reads this daily devotional, they will understand that God’s love is not conditional. While their friends might betray or lie to them, God’s love remains and His acceptance of them does not change with the way their day went. My wife was once a young woman of faith…and if anyone would know what girls go through, it would be her, particularly since she’s been endeared to so many 4th grade girls throughout her life. This devotional also defines what love really is…and it is not about being accepted by other girls or romantic feelings for someone. Love is sacrificial and this love was no better displayed than on the cross. 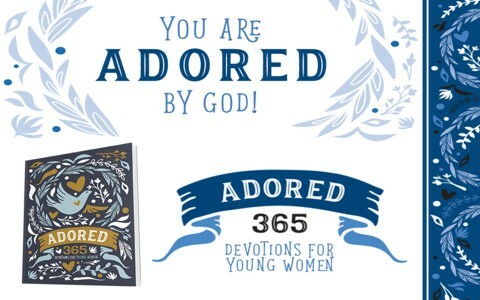 Adored – 365 Devotionals for Young Women builds up, it encourages, and it reinforces God’s unending love for them. When everyone else might forsake them, God never will, and the devotional, Adored – 365 Devotionals for Young Women, does just that. My wife highly recommends this devotional and I agree with her. Anything that allows God’s Words and God’s thoughts into a young woman’s mind will pay benefits today…and into the future. Even though I recommend Adored – 365 Devotionals for Young Women, I would add that a daily devotional cannot replace daily Bible reading and study. A devotional is intended to be a supplement to your daily time in the Word, but it cannot replace the reading of the Word of God because the Word of God has power to save and change a person (Rom 1:16; 1 Cor 1:18), and we cannot overlook the need for our daily bread, but the devotional, Adored – 365 Devotionals for Young Women, will help the young woman of God to build their understanding of God’s Word and allow them to take daily lessons into their lives, perhaps most important of all, that when all others forsake them and are anything but loving, God’s love never fails…and He is always there for them, no matter what. God never changes, and neither does His love for us, and this is just what a young woman of faith needs to hear. Even more so in a world that is less than loving. What a great idea for a Christmas gift or birthday gift for any young woman of faith. Resource: Franklin, Lindsay A. Adored – 365 Devotionals for Young Women. (Grand Rapids, MI: Zondervan Publishing, 2017). Previous post: What Did Jesus Teach About Marriage? Next post: How Does The Holy Spirit Restrain Evil In The World?